The last leg of our trip in Switzerland, this really started to get chilly! Time to bring out the cozy Christmas sweater and boots! Oh and my nana's vintage wool beret of course. I was feeling a real 'apres ski' vibe. 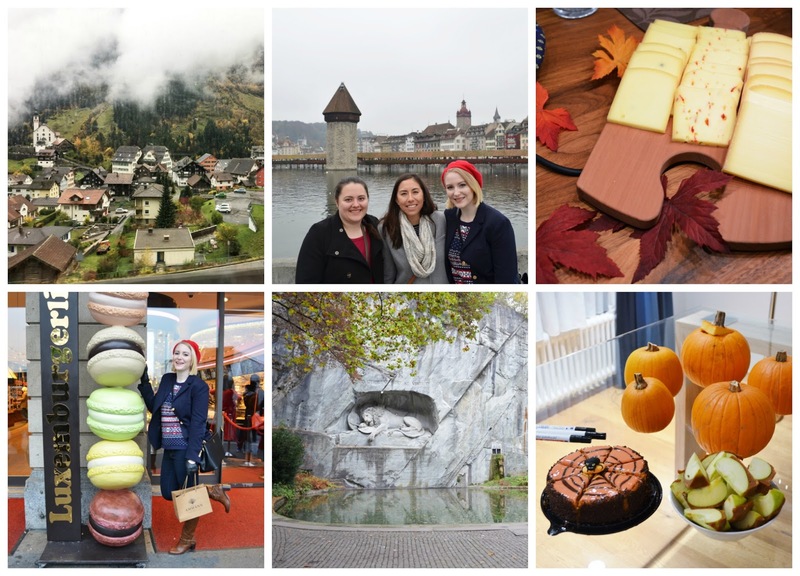 We spent a full day in Lucerne, exploring the town, doing some sightseeing, shopping - and of course - eating. It was a short train ride away from our hotel in Einsiedeln, and had a great view of the local towns we passed through. Once in Lucerne, our first stop was the famous wooden chapel bridge, Kapellbrucke.It stretches across the Reuss river, and even at this time of year, it had beautiful multi-coloured flowers lining the entire bridge. Our other must-see spot in Lucerne was the dying Lion, a beautiful monument carved out of a wall of sandstone above a pond. It memorializes the Swiss soldiers who lost their lives during the French Revolution. We had a moment of peace and quiet in between tour groups at that spot, and it was a nice moment appreciating the memorial in silence before the next tour group arrived... In between sightseeing, we shopped around the city (I may have bought gold edible peppercorns..random yet amazing...) until it was time to catch the train back! We spent the rest of our time in Einsiedeln with my family, basically eating and drinking until we floated away! We spent one evening dining on a traditional Swiss meal, Raclette, hosted by my family's home. I think I can speak for our whole group when I say it was one of the best experiences during our trip. Everyone was around a long dining table, with raclette griddles in the centre, for everyone to choose Raclette cheeses and meats to cook in right in front of them. And it was all accompanied by potatoes, small sides and good wine. It was great night with even greater people! Halloween was also during our stay in Switzerland, and while Europe is not big on celebrating this holiday, we thought it would be fun to bring a little bit of Halloween to Einsiedeln. We bought a whole bunch of mini pumpkins, a Halloween cake, made homemade caramel apples and spent the night carving pumpkins together. It was a blast! Stay tuned for next week...we're going to Paris! !